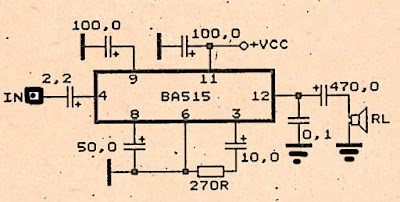 This Circuit Use a IC BA515 for operation it. This is very simple Amplifier schematic , with only add 8 component , such as resistor and capacitor. Minimum voltage require 3 Volt , this also low voltage amplifier . And maximum voltage require 9 volt. Power output under 10 Watt with impedance 4 Ohm. This circuit is very suitable for small speakers. - Check voltage on the circuit , wether or not the voltage. - Check wether the components are soldered onto PCB properly. - Check input and output wether working or not. - Check input output cable , if there are disconnected , or a short circuit. Or input connected with ground.